For security reasons the venue of U.S. president George Bush's meeting with his Uruguayan counterpart was moved 200 kilometres from the capital Montevideo. As Mr Bush continues his tour of Latin America, he faces more protests. 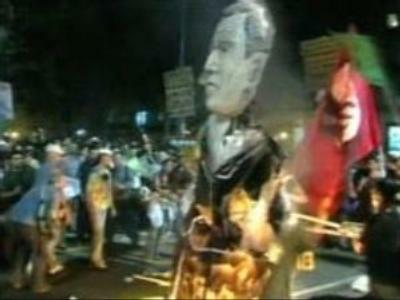 Large crowds of protesters all across Latin America are taking to the streets against President Bush's week-long tour. In Uruguay, the U.S. President was met by marching crowds. Mr Bush started off in Brazil, where he met with President Luiz Inacio Lula da Silva and signed agreements on alternative fuel production. President Bush wants to work with Brazil to boost ethanol development in the U.S. and reduce gasoline usage. In return Brazil wants reduce tariffs on ethanol imports. The agreements were met with defiance: protesters poured out onto the streets of Sao Paolo in their hundreds, clashing with police stationed around the city. Still, the American president has vowed to continue his tour despite the negativity. “I bring the good will of the United States to South America and Central America, that's why I am here. I don't think America gets enough credit for trying to help improve people's lives. My trip is to explain as clearly as I can that our nation is generous and compassionate, that when we see poverty we care, that when we see illiteracy we want to do something about it, that when we find there to be a deficiency in health care we'll help to the extent that we can,” said George Bush. Meanwhile in Argentina, Venezuelan president Hugo Chavez is countering Bush's tour with one of his own. He led a thousands-strong rally against what he calls 'imperialism'. As George Bush landed in Uruguay, the Venezuelan leader made no secret of what he thinks of the American President. “They have measured the amount of words he uses, and his vocabulary does not surpass 600 words. He has a very limited vocabulary. You know there are people who study these speeches. So, in his capacity to develop new ideas, he looks like a broken record,” he claimed. President Bush's tour is widely seen as a way of reducing the influence Hugo Chavez has in Latin America. He has also vowed to show the southern countries that they have not been neglected, as many of them say President Bush failed to keep his promise of making Latin America a priority when he came to power.